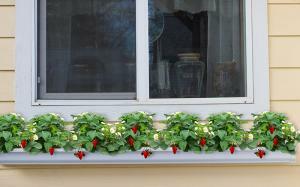 Rain gutter gardens are a creative way to make use of vertical space outdoors. If you have pieces of old rain gutter lying around, it's a great way to recycle them. The concept is simple: the rain gutters function as a long, shallow pot. Thus they're only suitable for plants that don't need a lot of growing space. They are conducive to long, narrow spaces. There are two main type of gutters - aluminum and plastic/PVC - both of which are suitable for re-purposing as a gutter garden. The metal gutters will eventually rust while plastic ones have potential to last indefinitely. Prepare the gutter in three basic steps. Determine the desired length. Gutters typically come in 20-foot sections, which is often too long to be practical for gardening applications. Plastic gutters can be cut to size with a hacksaw, while tin snips are suitable for cutting metal gutters. The ends of the gutter will need to be capped to prevent the soil from spilling out. Any home improvement center that sells gutters will also have the end caps. These are designed to snap into place, but you can also place a thin bead of silicone glue in the groove where the end of the gutter snaps into the end cap in order to seal it. Drain holes need to be made in the bottom of the gutter. Drill 1/2-inch diameter holes every 6 inches to prevent the plants from becoming waterlogged. A typical soilless potting mix, just like what is used for any potted plant, works well for a rain gutter planter. To prevent the soil from leaking through the drain holes, cut a thin strip of weed fabric and lay it along the bottom of the gutter before adding the soil. Rain gutters are built to be mounted on the edge of a roof and the same hardware used for that purpose (available wherever gutters are sold) can be used to mount them on almost any vertical surface - the side of the house, a fence, a wall, or a deck railing. Free-standing support structures can be devised to situate a rain gutter garden in the landscape. 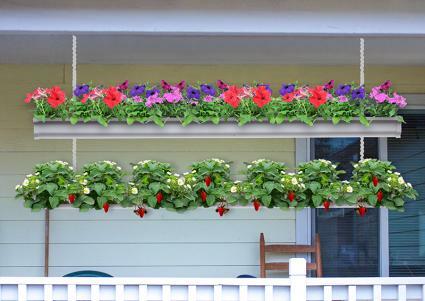 The gutter can also be supported from above like a hanging basket. Make sure the gutter is supported at least every four feet. The following examples give an idea of the different type of plants that grow well in the limited space of a rain gutter, as well as options for how and where to use them in the landscape. Larger vegetable plants like tomatoes or broccolli are a poor choice for a rain gutter garden, but salad mixes are perfect. These greens are typically harvested when small and tender and can be planted again and again for a constant stream of veggies. 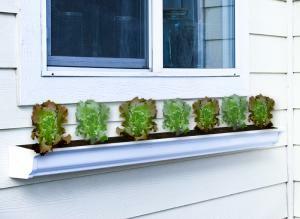 Mount a rain gutter salad garden anywhere that receives at least six hours of sun each day. In the summer, these will do much better if they get most of their sun in the morning and receive shade from the mid-afternoon onward. 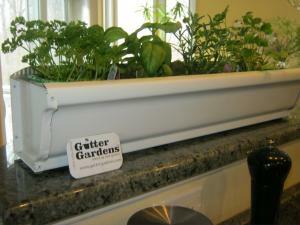 Along with small, leafy vegetables, many herbs can be grown in a rain gutter. Annual ones, like basil, dill and cilantro are a good choice, as are the smaller perennial herbs like chives, thyme and oregano. Larger herbs, like sage, rosemary and lavender will also work, but they will have to be replaced each year as if they were annuals because there isn't enough soil to allow them to mature. Grow these sun-loving species as close to the kitchen as possible, so you can grab them on a moment's notice. One popular use of rain gutter gardens is to grow strawberries - the only type of fruit that can possibly grow in such limited space. It is also an attractive way to grow strawberries, as the fruit dangles down on short stems like little red ornaments in the garden. Strawberries need six to eight hours of sun each day, but it's best if they have shade in the late afternoon so the plants don't sizzle in the heat. For gardeners that have problems with slugs and snails attacking their strawberries, this is a good way to keep the fruit off the ground where it can ripen to perfection. Succulents are adapted to growing in the cracks of rocks where there is little to no soil, making them a perfect candidate for a gutter garden. Work with the smaller species, such as sedums, echeveria, and sempervivum. Mix and match different varieties based on their size, color, texture, and growth habit to create a unique design. Succulents need full sun and are able to withstand heat and drought, making them a good choice for a rain gutter garden in a hot, exposed location. If you want to include small cacti use a cactus potting mix that's available at most garden centers, which will provide the extra drainage that these species need. Plants that grow naturally in wetlands also have minimal soil requirements - they just need a lot of moisture. These include unique species, such as pitcher plants and horsetail, along with the many grass-like reeds, sedges, and rushes that can be found in most nurseries with the aquatic plants. If you go this route, don't bother drilling drain holes in the bottom of the gutter. Instead, drill drain holes in the end caps about one inch below the soil level. This way there will never be standing water on the surface of the soil, which is important to prevent the gutter garden from becoming a breeding ground for mosquitoes. 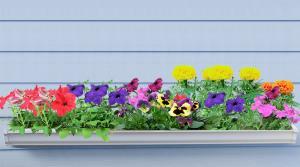 Rain gutters are a good alternative to conventional window sill flowers boxes, except they can be as long as you desire and mounted anywhere you like. The key is to utilize smaller species like pansies, poppies, and marigolds that will grow and flower abundantly in just a few inches of soil. You can change the flower mix with the seasons for a vibrant year-round display. Plant warm weather species in late spring and cool weather species in early spring and late fall. There are also sun-loving annuals and shade-lovers to choose from, depending on the sun exposure available. Growing plants in a rain gutter is not all that different from growing them in other containers, but there are a few things to keep in mind for best results. Gutter gardens dry out fast because they are so shallow - it may be necessary to water twice a day in the heat summer to keep the plants from becoming dessicated. The nutrients will be quickly leached out, so it's important fertilize gutter gardens frequently, with the exception of bog and succulent gardens. By the end of the growing season the soil will become a solid mass of roots, so it's best to replace it with fresh soil on an annual basis to keep the plants happy. 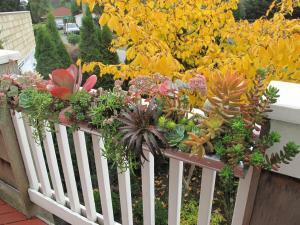 Gutter gardens are an easy way to make better use of small garden spaces. The creative possibilities are endless, so try challenging yourself to come up with a unique design that fits the vertical space you have available.